Students should not have to struggle to learn basic math facts. Rocket Math is carefully designed so all students can easily master math facts to a fluent level. How does it work? Rocket Math works well because it teaches no more than 2 new facts and their reverses on each practice page. For example in the very first addition practice page, Set A, introduces 1+3, 3+1, 1+2, 2+1, while Set B adds 4+1, 1+4, 5+1, 1+5. Sometimes the pace is slower adding only one fact on a page (for example Multiplication Sets L, M, N, O) where experience has shown students need a slower pace. The program allows each child to go at his or her own pace, taking up to six days to master those two facts as needed. Each day in class students practice in pairs for two to three minutes each. Students can, of course, also practice the same way at home. The parent letter explains how this should be done at home. Instructional poster on How to Correct. Students should practice in pairs at school. At home students should practice with a parent or a responsible sibling. One student, the “learner” sits with the practice sheet in front of him/her. The problems for practice go in a circle around the outside of the page and should not have the answers written in. The learner will practice only these outside facts. The learner reads each fact (not just the answer) aloud and says the answer. The other student, the “checker” has the answer key and listens for a hesitation or an error on one of the facts. That is a fact that needs extra practice. Repeats the problem and tells the correct answer. Asks the learner to repeat the problem and the answer three times. Asks the learner to back up three problems and begin again. Students go around the outside of the page as many times as they can in the two or three minutes allotted for practice. At home, we recommend once around. After practicing each day the students take a one-minute test (found in the center of each practice sheet). This test gives them an opportunity daily to show they have learned a set of facts by writing answers as fast as they can write. If they pass the test (the passing criteria is based on the writing speed test which is used to set their individual writing speed goals) they move on to the next sheet in the sequence. If they don’t pass the test, they practice on the same sheet the following day. Once students “pass” a set of facts, they color in the letter for that set on their “Rocket Chart” and then graduate on to the next practice page. 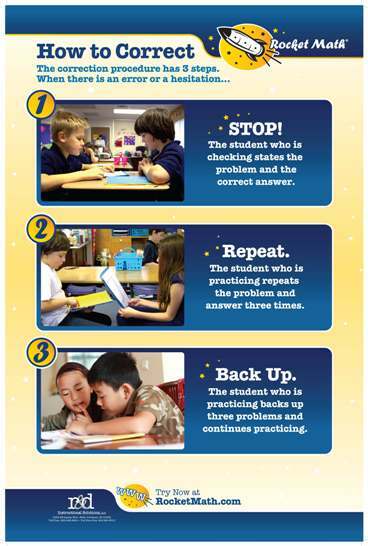 Rocket Math includes several award certificates that reinforce student learning and increase their motivation. Rocket Math has progress monitoring built into the program. Once a week students take a two-minute progress monitoring test of all the facts in the operation they are practicing. Each student has an individual graph on which to graph their increasing fluency with math facts. These graphs demonstrate student learning and should be shared with parents. The complete, informative and entertaining Teacher Directions are available for free download so you can totally familiarize yourself with the program before ordering.